Brightness is a complex factor that can be defined as an illuminance of a surface as perceived by a human eye. In such a definition brightness can be expressed as a ratio of luminous intensity of a surface under certain angle to the surface area of its projection. Brightness is a directional unit, depends on luminous intensity in different directions and directional reflectiveness of a surface and the projected area of a surface in a given direction. Harmonious distribution of brightness is important for sharpness of vision and sensitivity to contrast, contrast being relatively small differences in brightness. Setting the brightness too low can again cause strain, decrease the visual stimulation and therefore also work performance. Darker surfaces in the room can work against the harmonious distribution of brightness and can cause feelings of oppression and anxiety. Human vision is the most important sense for gathering information; the brain gets 80 percent of all information from visual cues. The quality illumination is the key to process and gather the information correctly. Brightness is the only factor to which our eye reacts. Correct illumination should therefore take distribution of brightness into account. The eye has different sensitivity of vision depending on the angle. The most sensitive part is at 10 to 20 degrees from horizontal axis. 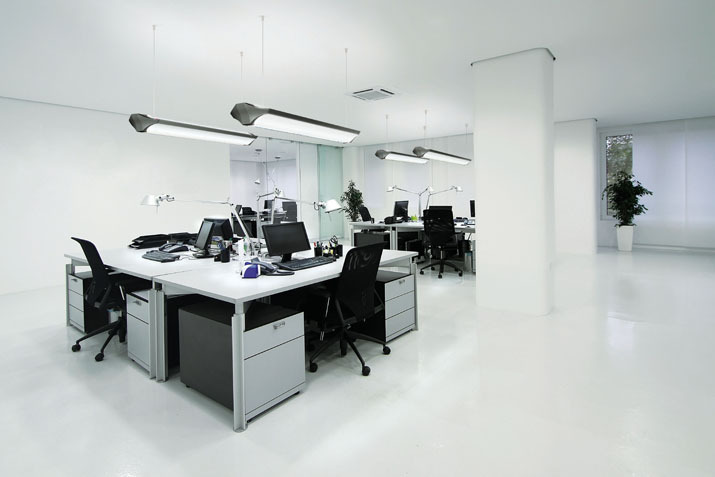 In this section high brightness is to be avoided, as it could cause glare, which has negative consequences on well-being, comfort levels and health. In the case of glare the pupil is contracting, decreasing the perception and the ability to discern brightness levels. Quality of luminaires can help with the brightness distribution, but the interior design plays its part as well: proper furnishing of the space and the materials used affect harmonious distribution of brightness. Brightness is a complex factor that can be defined as an illuminance of a surface as perceived by a human eye. In such a definition brightness can be expressed as a ratio of luminous intensity of a surface under certain angle to the surface area of its projection. Brightness is a directional unit, depends on luminous intensity in different directions and directional reflectiveness of a surface and the projected area of a surface in a given direction. Its unit is candela per square meter. The standard light-related value for the impression of lightness is the brightness per unit of area, because only the eye perceives it. It is derived from the directed stream of light in relation to the perpendicularly illuminated area of the recorded solid angle. Harmonious distribution of brightness is important for sharpness of vision and sensitivity to contrast, contrast being relatively small differences in brightness. Eye strain can be caused by too high a brightness, which can cause glare and too large contrasts in brightness, where eyes need to constantly adapt to significantly different lighting conditions. Setting the brightness too low can again cause strain, decrease the visual stimulation and therefore also work performance. To achieve uniform brightness distribution all surfaces have to be taken into account and their brightness calculated. Once again, achieving optimum brightness conditions is a task for interior designer as well, as he needs to choose brighter colours for interior surfaces, walls and ceilings. Darker surfaces would work against the harmonious distribution of brightness and can cause feelings of oppression and anxiety. The standard EN 12464-1 actually calls for specific reflectance of surfaces: for ceilings it is 0.7 to 0.9, the walls 0.5 to 0.8. The floor is the least important factor from the brightness and reflectance point of view, with required reflectance only 0.2 to 0.4. On the other hand, even furnishings and machinery are limited in their reflectance to 0.2 to 0.7. Which means they should not be much brighter than the walls, but also not too dark, as this works against the proper brightness distribution. The main surfaces should be illuminated uniformly as well. The minimum illuminance of walls is set at 50 lux with uniformity over 0.1; the ceilings have their minimum at 30 lux with the same uniformity. Unlike the other factors, LQS awards 0 to 5 points based on illuminance level and its uniformity on room surfaces: the highest marks demand illuminance of walls of over 150 lux with uniformity of over 0.3. Same contrast is required for ceiling with illuminance over 75 lux. This is stricter than the EN 12464-1 standard requirements.